Our new range of customisable, fully modular event bars. Designed and built entirely by us. What suits your style’s space or event? Choose your front bar in Black, White, brushed Aluminium, Weathering steel, Mirror, Stone effect, Wood, Chersterfield, Fabric or choose from our extended catalog of images. Do you have your own artwork, logo or text? We can print on fabric or any rigid surface, matte or gloss, with white ink or in photographic quality CMYK. And if you need graphic design service our studio with a qualified team of designers can definitely help with your requirements. The bar tops can be supplied in any waterproof material, acrylic black or white. Special finishes are also available like stainless steel, brass, wood. 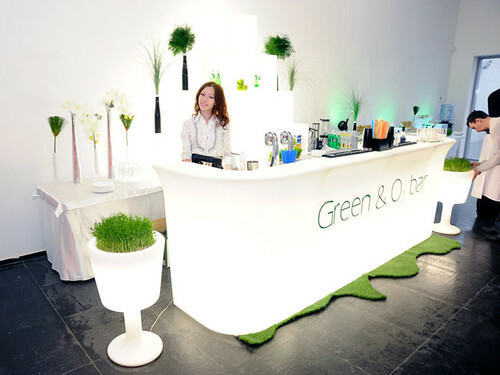 One feature available on request for our bars is the illuminated bar tops to create an evocative effect for your event. Our straight section of the bar are designed to accommodate an under counter fridge. New range of our customisable, fully modular event bars. Here you can see some of the previous work we have completed. Our add-on graphics are specifically chosen for the product you are hiring, so the material will differ from product to product.